The revolution in Rojava — founded on principles of anticapitalism, Kurdish self-determination, and women's liberation — is at risk of being wiped out. And the Trump administration may just turn its back. In northeastern Syria, the Kurdish-led Syrian Democratic Forces (SDF) are spearheading a final military campaign against the Islamic State — attempting to defeat the organization once and for all. Their effort is part of Operation Roundup, a military mission backed by the United States. The Syrian Kurdish fighters that form the core of the Syrian Democratic Forces are well-known on the international left. Over the last several years, they’ve led a remarkable social revolution in Rojava, the northern part of Syria, where they are seeking to establish an autonomous, anticapitalist territory that secures Kurdish self-determination while overturning gender-based hierarchies. The revolutionary goals of the Syrian Kurds make them unlikely partners for the United States. Although US officials have repeatedly praised the SDF as the most effective anti-ISIS fighters in Syria, Washington has made no secret of its opposition to the revolution in Rojava. Earlier this year, US officials gave Turkey the green light to invade and conquer Afrin, one of Rojava’s three cantons. More recently, the US has been pressuring Kurdish military leaders to leave Manbij, an area that the SDF liberated from the Islamic State in 2016. It’s unclear what President Trump thinks about all of this. He recently praised the Kurds as “great fighters” and “great, great people,” but he previously expressed little concern about their fate. 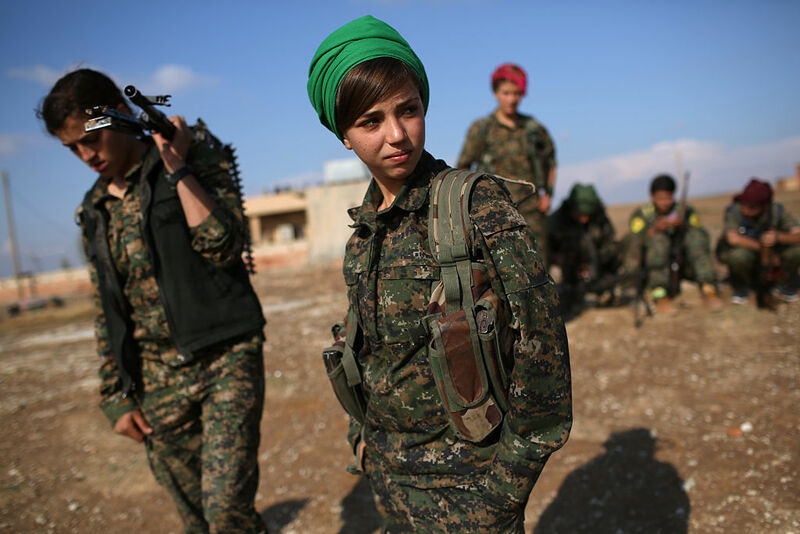 The values that Trump personifies — American capitalism, plutocratic governance, anti-feminist reaction — are sharply at odds with those of the Rojava revolution. During a congressional hearing the same month, Maryland senator Chris Van Hollen asked Secretary of State Mike Pompeo to pledge “that you’re not going to be bullied by Turkey or President [Recep Tayyip] Erdoğan to throwing the Syrian Kurds under the bus.” Pompeo replied that “there’s no administration intention to hurl any large yellow objects whatsoever.” And then last month, the Trump administration reversed the president’s earlier decision to withdraw US forces from Syria. While Trump continues to oscillate, leaving many observers wondering what he will do next, Syrian Kurdish fighters remain determined to not only liberate the final areas of the region still in ISIS’s hands but to achieve their social revolution in Rojava. The machinations of the various powers active in the region will largely determine whether the Syrian Kurds will have the chance. Syrian president Bashar al-Assad has vowed to retake Rojava. Turkish president Recep Tayyip Erdoğan has repeatedly threatened to annihilate the Kurds’ radical experiment. And American support has been contingent at best, always subordinated to the greater concerns of US empire. The experience of Afrin and Manbij have confirmed the Syrian Kurds’ worst fears about the Trump administration’s sincerity. In January, Turkish troops, with the approval of the US, invaded Afrin. They pummeled the canton until March, wreaking devastation and causing mass exodus. About five hundred civilians and more than eight hundred Kurdish fighters died during the Turkish offensive. More than one hundred thousand residents fled the area, and by the end of May, more than 134,000 people remained displaced. Those still in Afrin are suffering material deprivation and surging violent crime under the new Turkish-backed leadership. The Syrian Kurds are also facing a major challenge in nearby Manbij. After Erdoğan threatened to extend his invasion of Afrin into Manbij, US and Turkish officials made a deal that requires the Syrian Kurdish fighters to withdraw from the area. Rather than coming to the defense of the Syrian Kurds, US officials opted for appeasement. US and Turkish military forces are set to begin joint patrols of the area. The deal is a major setback to the revolution in Rojava. Since expelling the Islamic State from Manbij, the Syrian Kurds have overseen a transformation so striking that even US officials have praised it. After visiting Manbij in July, Defense Department official John Rood marveled at how he had walked freely and safely through neighborhoods that had previously been under ISIS control. “It was really remarkable to see,” Rood said. Although the Trump administration has been willing to deal away the gains of the Syrian Kurds in both Afrin and Manbij, it has continued to find it beneficial to preserve some elements of its partnership with the Syrian Democratic Forces. Together, the SDF and the US military control the northeastern part of Syria, including the country’s largest oil fields. About two thousand US military forces are positioned at military bases throughout the area. Typically, US officials say they need to maintain their military presence to ensure the Islamic State has been routed. “We’re remaining in Syria,” State Department official Brett McGurk announced in August. “The focus is the enduring defeat of ISIS.” A month later, State Department official James Jeffrey provided additional confirmation, saying that “we are not in a hurry” to leave Syria. US officials are taking advantage of the situation to pursue other objectives as well. For starters, they are using the US’s military presence to keep up the pressure on Syrian president Bashar al-Assad, making it more difficult for the Iranian and Russian governments to support him. In August, US general Joseph Votel, the commander of US Central Command (CENTCOM), said that US involvement in Syria has a lot to do with the Russians. “It’s an aspect of great power competition that plays out right here in the CENTCOM area of responsibility,” Votel said. Iran looms large as well. Numerous officials in the Trump administration have pointed to Iran as the main reason for their ongoing involvement in Syria. In June, State Department official David Satterfield told Congress that US military forces would not leave Syria unless Iranian forces depart the country first. “Any decision on the US military presence anywhere in Syria, A, is a presidential decision, [and] B, depends absolutely on the exit of Iran from Syria,” Satterfield said. Ongoing US support for the Syrian Democratic Forces is therefore at contingent at best. If US officials can find others ways to achieve their objectives, then they will undoubtedly cut the Kurds loose. After all, US officials largely view the SDF as “our proxies” who are “working for us and doing our bidding,” as General Raymond Thomas, the commander of US Special Operations Command, once put it. Although the Trump administration appears to have decided to maintain US forces in Syria for now, one big question remains: will it continue working with the Syrian Kurds? For months, a number of current and former US officials have argued that the time has come to sever ties with the Kurds and refocus on the relationship with Turkey, a NATO ally. Given that US-Turkish relations have faltered considerably over the past few years, especially after Turkish officials accused the US of being involved in the July 2016 coup attempt against President Erdoğan, the Trump administration may find it difficult to revive the alliance. In August, the Trump administration imposed sanctions and increased tariffs on Turkey, exacerbating the country’s economic crisis. At the same time, the deteriorating relationship has not prevented the two countries from working together militarily. The US and Turkish governments are currently working in tandem to prevent a Syrian incursion into Idlib Province, where at least 3 million civilians and thirty thousand anti-Assad militants are cornered. “Turkey has helped us very much with that whole situation,” President Trump recently said. Jeffrey also indicated that the US partnership with the Syrian Kurds was making it harder to achieve a rapprochement with Turkey. He noted that Turkish officials view the revolution in Rojava as a project of the Kurdistan Workers’ Party (PKK), a militant Kurdish liberation organization that the Turkish government has been battling for decades. There has been “a lot of bitching” from the Turks, he said. Given the situation, the Syrian Kurds are facing significant uncertainty about their fate, not to mention the numerous threats to their very existence. Although US officials are supporting them for now, it remains to be seen whether ongoing pressure from Turkey or other geopolitical factors may lead to a change in US policy. Yet if the US turns its back on the Kurds, it will not only be sacrificing the heroes of the war against the Islamic State in Syria — it will be risking the revolution in Rojava, the most promising democratic experiment in the Middle East.